The pain gang is at it again! The Sultan's of Sizzle have been scheming together and concocting their secret recipes to bring you the latest in their line of hot! They've taken a break from their signature sauces to bring you back to a simpler, more traditional style of sauce. 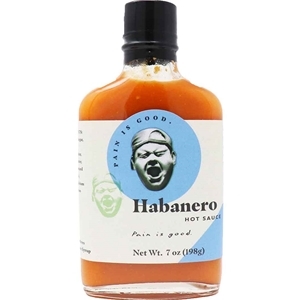 So whether you're eatin' some crawdads, eggs, tacos or a big fat juicy ribeye steak, this Pain Is Good Habanero Hot Sauce will do you just fine, so enjoy! 7oz. One of the best Hot Sauce I have had..